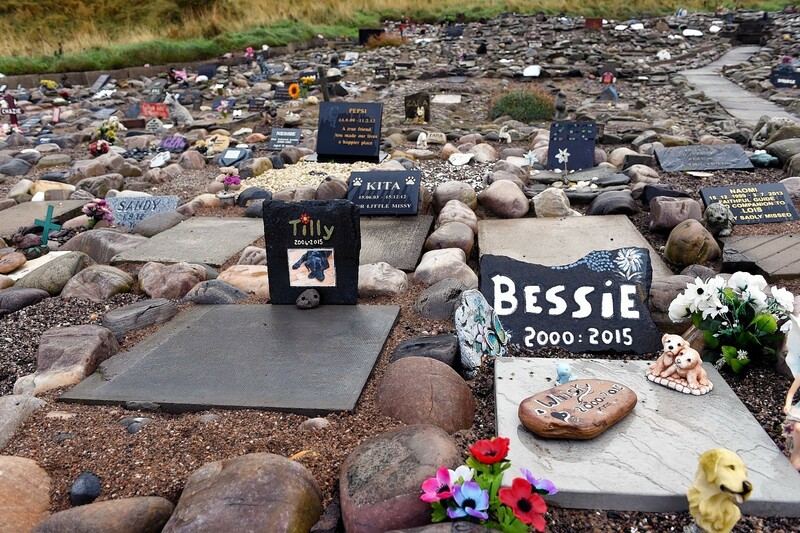 Stephen Findlay has tended plots at Cullen’s animal graveyard for nearly 25 years, offering a scenic resting place for scores of family pets, and even burying a dolphin and shark which were washed ashore. The 77-year-old has filled about an acre of ground overlooking the coast with burial plots, all on a completely voluntary basis. Mr Findlay was chosen as the recipient of Third Sector Interface (TSI) Moray community champion award late last year, but the shy volunteer chose not to attend the prizegiving ceremony along with other recipients. Instead, a gathering of dignitaries braved the elements to present him with the plaque and certificate at the seafront yesterday morning. 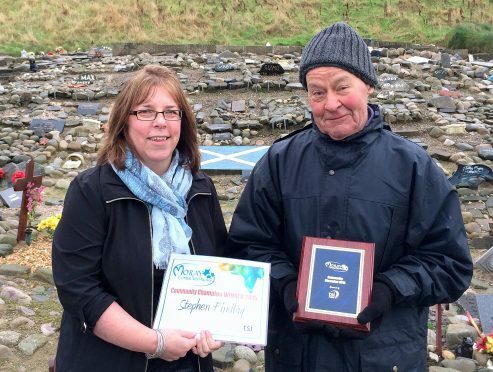 TSI Moray’s operations manager, Jackie Mclaren, said: “Because Mr Findlay wasn’t at the ceremony we went out to the pet cemetery and presented him his award there, which we felt was very appropriate. 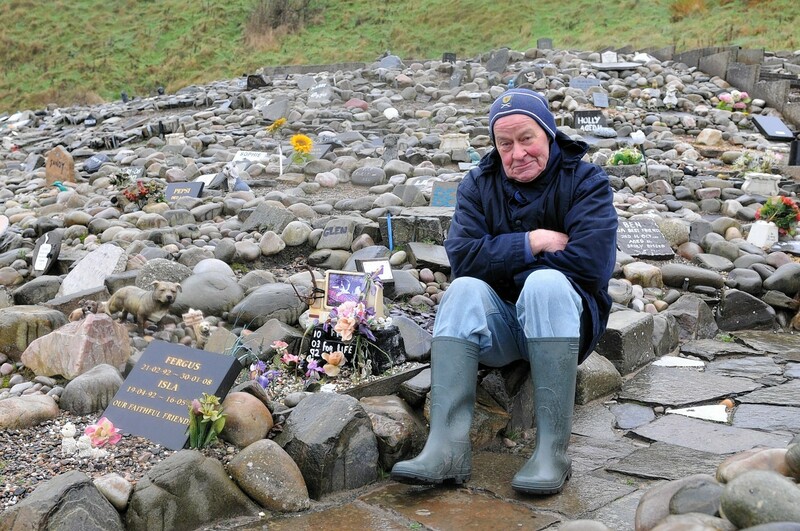 Unsung hero Mr Findlay was brought to the public fore in September when landowners accused him of “encroaching” the agreed boundaries of the cemetery, and warned against further expansion. Legions of Cullen locals rallied around Mr Findlay, with more than 1,500 backing a petition calling for Seafield Estate to guarantee the future of the site. The estate later pledged to support Mr Findlay in developing further plots on ground which is mutually agreeable to both parties. Resident Joe Simpson has championed the volunteer cryptkeeper since that time, and has campaigned for him to receive official recognition for his efforts. Yesterday, Mr Simpson said: “It’s great to see Mr Findlay getting an award for his work. The pet cemetery began after local doctor Susan Morrison asked Mr Findlay to bury her pet spaniel in 1992. When a porbeagle shark washed up on the beach at Cullen last November, it was given a respectful burial at the seaside spot. Mr Findlay said it was the biggest plot he had ever dug, and posthumously named the creature ‘Lady of the Sea’.